Operational Challenges in Indian Retail Industry | Business Article | MBA Skool-Study.Learn.Share. India is an attractive market for retail investment. The sector is witnessing dominance of large domestic players, like Reliance, Bharti, AV Birla Group and international conglomerates such as Wal-Mart, Marks & Spencer, Tesco etc. Current Indian retail scenario looks gamut because of poor supply chain, infrastructure, policy barriers, untrained workforce and inconsistent sourcing systems. In the Indian retail huge investments, government policies, third party intervention, and changing consumer preferences will distinguish supply chain revolution. Operational inefficiencies in terms of stock out percentage, shrinkage, wastage, inventory turns, storage cost and logistics as a percentage of costs is very high compared to global norms. Hence, Supply chain will be a differentiating factor that gives the competitive advantage to firms. Thus planning and investing in field of supply chain in the areas of sourcing (contract farming), distribution centers (warehouse, cold storage), transportation networks (3PL), inventory (both store level and warehouse) (VMI), supply chain information systems such as warehouse management systems, planning, forecasting, inventory management, backward integration, quality management systems, service monitoring and control will improve the network and the business. On a long term basis, there would be a need to build a flexible supply chain which would be capable of responding to changes, intrinsic or extrinsic changes, drastic or slow changes, in demand, supply and technology. The analysis attempts to analyse the factors driving growth and outlook for the ‘Organised retail industry’. Has grown at a CAGR of 14.6% for the period FY07-12. Food & grocery is estimated to have remained the highest contributor at 58% of the total retail sales during FY12. During FY07- 12 (p), the organized retail in India has grown at a CAGR of 26.4%. Food and grocery contributed to 24.3% of the total organized retail sector. Expects the penetration of organized retail in the total retail pie to increase to 8.8% by FY15. Disappointing Footfall. Despite constant promotional offers and deep discounts, consumers are expected to cut down on their discretionary spending. Banks hesitant to finance due to falling demand and low profitability. Higher cost of funds and slowdown in demand can result to delay of projects in the near future. Huge debt funding and high interest payments. Poor supply chain management and weak back-end support infrastructure. Expanding and building on logistics and technology initiatives are weak. Low level automation in warehouses and not enough quality measures. Rentals – skyrocketing to all time high. Retail space in urban areas is expensive and keenly contested. Retail spaces in tier II, III cities and semi-urban areas are plagued with issues such as inadequate infrastructure, as roads, electricity, and cold chain. Organized sector does not have industry status. It is further making it difficult for the players to raise funds for their expansion plans. Policy induced barriers – Organized retail in India is managed by both the Ministries of Commerce & Consumer Affairs. While the Ministry of Commerce takes care of the retail policy, the Ministry of Consumer Affairs regulates retailing in terms of licenses and legislations. A long way to meet international standards. 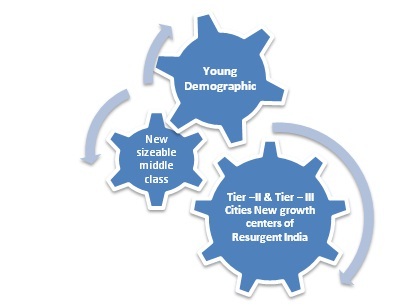 Demand of skilled workforce is high but there is talent shortage & lack of trained manpower. Succeeding in India’s retail sector is a combination of choosing the right retail real estate, localizing products and mastering the supply chain. 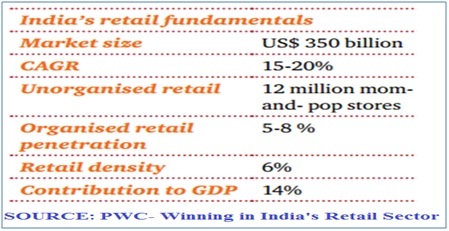 Research: PWC-Winning in India’s retail sector. There is significantly more margin in private labels due to fewer middlemen. There is ~100% control over the pricing, branding, sales, etc. A niche consumer loyalty is created for the private label unlike national brands. Merchandizing, local advertising and other core functions should be done by company itself instead of outsourcing. b) Store location selection based on proper research: Catchment area analysis has to be done extensively. Potential demand, supply of merchandise and store image-related factors in locating the retail outlet is important. Layout should suit both impulsive and situational needs. c) Localisation of stores: Getting the merchandise mix right. Collect past data to understand the customer buying behaviour. Equip category managers or select category captains to improve assortments. Robust Supply network planned for micro and macro sourcing as well as Distribution. Follow Hub and Spoke model. Milk run distribution model will reduce costs. Cold Storage and Refrigerated vehicles to improve product shelf life and reduce wastages. e) Contract Manufacturing will reduce any further capital expenditure. 100% sourcing networks is viable. f) Integrate backwards to procure directly from farmer where APMC (Agriculture Produce Marketing Committee) acts have been amended to facilitate this process. j) Quality - Quality Management System comprising Quality Control and Quality Assurance departments to ensure end-to-end quality control-from raw material procurement to manufacturing, packaging and delivery at the doorstep of the customer. k) Outsourced transportation – 3PL: Parts of the value chain may be outsourced to a 3PL while a company can look into backward integration for critical areas. l) Average levels of stock, order levels and the retailer has to keep a tight control on costs associated with each transaction in the selling process. n) Setting the right price point. o) Focus on profit instead of volume (be ready to lose an occasional sale). p) Provide extraordinary service and after sales support. q) Employ the best possible staff. This article has been authored by Senthilkumar Pazhamalai, SCMHRD.